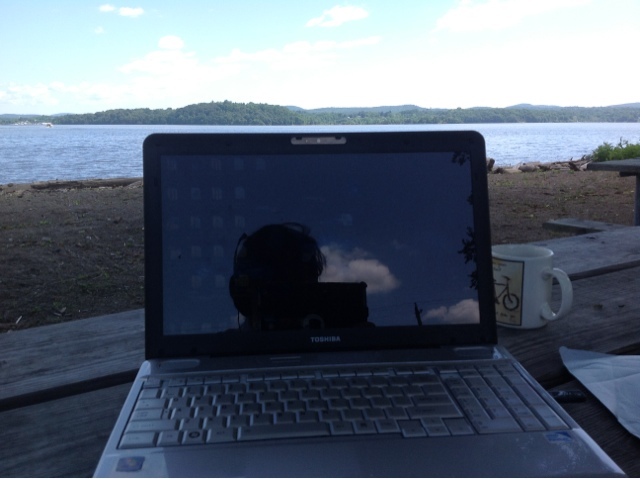 But today I woke up, saw the beautiful weather, and got inspired to go down to the Hudson with my big bag of technology - to see if I could pull off setting up shop there for the day. It worked! Now, this is not going to work in every line of work. I imagine if you are a surgeon, you might have trouble getting your patient to agree to have a brain transplant while geese are pooping nearby. But if you're lucky enough to have chosen a field where technology helps to make you mobile, then read on. Truthfully, I needed a lot less than I thought I did. It reminded me of the time I went on a Boy Scout camping trip, loaded up with every possible piece of equipment. I started crying after 5 miles of hiking, and the lighter, faster scouts were kind enough to carry my excess stuff. 1. Laptop - No getting around this one. Even though you might have a cool iPad or tablet, there is nothing more work efficient than a laptop with all your essential programs loaded up on it. You should also have a mouse and mousepad, as well as a backup battery or two. As an alternative, some locations have power outlets. Make sure you check with the park reps and ask if you are allowed to plug in. 2. A wifi connection - Another absolute necessity. If you have a 3G or 4G data plan you might be able to tether it to your laptop, but there are other ways as well. Sometimes if you are lucky the location has a wifi signal, or a local coffee shop might be close enough to utilize. Either way, make sure you are using any wifi signal you find WITH permission. 4. Other communication tools - here's the important stuff. A. Skype: If you have a basic US plan (for just $2.99 a month) you can call anywhere in the US. Use this instead of your cell. B. Google Voice: Use it for incoming calls, route them to your cell or to your Skype number so you can answer them easily. When you return to your office make sure you switch your routing back to your normal phone number. C. Email: um, this is Captain Obvious, but it had to be said. Oh also Facebook messaging and Tweeting is good. But try to manage all of it in one place, you don't want to keep going back and forth between your laptop and mobile device answering stuff, it is inefficient. D. Web based team productivity tools: there are great tools for getting your work done with others in the mix. I personally like Manymoon for project management, Zoho CRM for tracking potential deals, and Dropbox to sync important files with colleagues. 5. Optional devices - I gotta say, my life has changed since I got an iPad. It really makes the web...fun again. Even now I am writing this blog post in Starbucks in New City after my awesome workday. So I do recommend that you get a tablet and see your computing life in a different way. And it will help you get work done while you are mobile. 6. Shade - As I quickly learned, it is important to find a shaded area to do your work, since the sun will quickly make you squint over your screen. So bring an umbrella or find a shady spot. Also this may help if for some reason the weather turns against you. 7. Food and drink - because you don't want the parks department to accidentally rake over your lifeless body after you die from starvation for being too work-driven to even take a 10 minute food break. ...not that this happened to me. 8. A plan - you should plan to NOT do certain work at the beach, simply because it won't be effective to do so unless you are back at the office. So before you get to your new spot, have a simple agenda that outlines only the important things you need to, and can accomplish while there. 10. Zen - This last one might be something you find at the beach, or perhaps it will find you. But if you go to the beach, lake or any other spot that will be enjoyable, make sure you get up every once in a while and observe the beauty around you. Even while you are working, listen to the sounds around you. Look up at the ocean or river sometimes. This is what it's all about. No matter if you're crunching numbers, designing websites, performing brain surgery, managing a workforce or writing a law brief, for those small moments that you take in all that is beautiful about the world...you are free.